Winter is a great time to look at the trees and shrubs around us. We get a clear view of their shape and structure and a reminder that warmer weather is on the way when we look at the buds that will brings leaves and blossoms in the spring. Late in the summer after I graduated from high school, my grandfather and I were walking around his garden. I asked him what flower would be blooming so late in the season from the buds on one of his shrubs. He told me that they were the buds for the flowers for next spring. I was shocked both at the concept and the fact that I had gone through twelve years of school and didn't know such an obvious fact about the world around me. It is a reminder that we have much to learn from observing the world around us and from our elders. I made my book with reused US Letter/A4 paper folded in half the long way with the writing on the inside, a horse chestnut twig, and an elastic. I snipped the twigs and did my drawings at home but you could also do your sketching outdoors. What a great way to capture a memory! 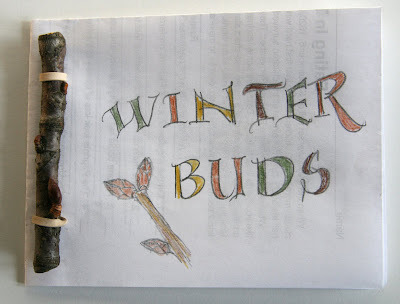 Making a book about these "winter buds" is a wonderful way to illustrate our living world around us. Thanks for sharing. This is such a simple project but so much fun. I have a lot of one side printed papers around and this is a great upcycle. I've only recently found your blog, and love it. Thanks for your generosity.